The Scottrade Center is home to the St. Louis Blues of the National Hockey League, and much more. Besides ice hockey, the 18,724-seat arena, first opened in 1994, annually hosts a range of nearly 200 events including wrestling matches, boxing bouts, basketball tournaments, concerts, ice shows, family shows, graduations, and more, drawing nearly two million guests. 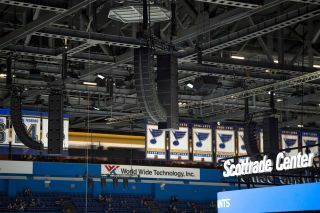 But like other venues of its vintage, the Scottrade Center’s original sound system was not able to keep up with the demands imposed by a wider range of applications that require comprehensive audience coverage, full-spectrum music reproduction, and excellent speech intelligibility. It now has that capability, thanks to the implementation, last autumn, of an AVB-networked L-Acoustics Kara sound system designed by Dallas-based consultancy Idibri and installed by the local L-Acoustics Certified Provider, Logic Systems Sound and Lighting. The new Kara system, powered by 33 AVB-equipped LA4X and one LA12X amplified controllers, consists of 90 Kara loudspeakers and 36 SB18i subwoofers, divided into six equal arrays of 15 Kara and six SB18i. In addition, six ARCS II, configured in two clusters of three, are positioned facing straight down for ice coverage and special events. What’s especially remarkable, according to Idibri, is that this Kara system design provides such comprehensive coverage of the bowl’s seating areas that an option to add under-balcony speakers was abandoned the first day the system was turned on. “Although L-Acoustics’ K2 was initially specified and provided 6dB more SPL, Kara was eventually chosen because it was able to meet actual SPL requirements for the arena and a tighter budget, allowing funds to cover more aspects of the overall renovation, including updating the AV systems in the locker rooms,” said Ben Cating, senior consultant and project manager for Idibri, which also designed a new center-cluster video scoreboard system for the arena. Amazingly enough, the smaller Kara boxes were still able to provide the high degree of coverage, volume, and intelligibility that the arena project demanded, allowing the budget to be stretched without any compromises. The Kara system from L-Acoustics was chosen in part due to its power-to-weight ratio. The Scottrade Center project did have its challenges, but the AV integrator’s expertise combined with the Kara system helped with those as well. “The primary challenge was to place six arrays in very precise locations in a building with asymmetrical steel and a labyrinth of 10-foot-diameter steel air ducts that always seem to be in exactly the wrong place,” said Logic Systems Sound and Lighting president Chip Self. In fact, Cating recalled, all of the Kara loudspeakers were able to be hoisted into place within a single day, allowing the crews to focus on wiring and tuning the system.